It’s no secret that online no limit holdem games are getting tougher by the week. Training videos, coaching, and discussion forums have all contributed to a huge rise in the standard of play over the last 5 years, to the point where nowadays only the elite players can make good money at holdem. Following the trend of higher stakes games, players are gravitating towards other variants. Next inline in terms of popularity at the high stakes tables after pot limit omaha and omaha hi-lo comes 2-7 triple draw; an action packed game that a lot of players aren’t too familiar with but one which high stakes pros like Phil Galfond and Brian Townsend have put a lot of time into learning recently. Theory for games like 2-7 is much less developed than for holdem and so there is the potential for players to develop their own individual style which can be very profitable, particularly against the larger pool of fish that play the less common games. How does 2-7 Triple Draw Work? In the beginning, 2-7 TD will seem alien to those who have spent their whole lives playing holdem, less so to those who might have played a bit of 5 card draw in home games in their younger days. The first oddity of triple draw is that it is a lowball game, meaning the worst poker hand wins at showdown. In the 2-7 variant, straights and flushes count against you, so the nuts in triple draw is the worst five card hand possible hand in poker 2-3-4-5-7, known as the ‘wheel’. Next in line comes 2-3-4-6-7 then 2-3-5-6-7 and so on. 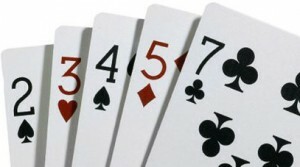 The task of reading the strength of a hand proves daunting for a lot of new players but there is a reasonably easy way to go about it: Simply read your hand as 5 digit number starting with the highest card to the lowest. The hand which makes the lowest 5 digit number wins; so for example 9-7-6-5-4 would beat 9-8-4-3-2. Once the pre-draw betting action is complete, the first drawing round takes place, where players can replace as many cards as they wish from their hand. If you like the look of your cards and don’t want to replace any, you can ‘stand pat’ and keep them all. Following the first draw, there is a betting round which begins with the small blind and continues around the table where the betting limit is fixed at the small bet amount, and the action is again capped at 4 bets. After the second betting round comes the second draw and then another round of betting, followed by the third and final draw (hence the name triple draw) and a final betting round. For the last two betting rounds the betting limit is fixed at the big bet amount. Following the 4th and final betting round, there is a showdown, if two or more players remain in the hand, and the worst 5 card poker hand wins the pot. More often than not in low stakes triple draw games, you’ll see hands like 7-lows and 8-lows taking down the pot, and for the most part they are the hands that you should be drawing to as you learn the ropes. Just like with holdem, good starting hand selection is the way to go and as a rule of thumb, you should only be drawing two cards at most if you’re playing a hand. Of course there will be times when you can steal the blinds with a three card draw if your opponents are very tight, but by and large your bread and butter should be two card draws. Position is even more important in triple draw than in other games. Why is this? Because in a triple draw hand you have six decisions to make: your three drawing decisions and your three betting decisions. If you’re in position, then you get to see what your opponent does six times and can use this information to your advantage. This is another reason to play tighter in early position and the blinds. In early position, you want to avoid opening with weaker two card draws. Not all two card draws are created equal in triple draw. A hand like 2-3-7 where you have three to a wheel is the best type of two card draw, whereas a hand like 8-7-5 is much weaker. With the latter hand you’re often going to end up catching very rough draws like 8-7-6-5-x and the best possible hand you can make is an 8-7, meaning you could be drawing dead on the later streets quite often if your opponent hits a pat 8-6 or better. There’s also the danger of drawing to a straight if you pick up a 6 or a 4. One way to consistently maintain an edge over weaker players in triple draw is to stick to drawing smooth. One extremely good tip for new 2-7 players is to never play a starting hand without a 2 in it. Triple draw hands are built from the bottom up, and consistently playing hands without a 2 will lead to you drawing rougher on later streets and making rough hands more often. As you become familiar with the game, you’ll understand how important the 2 is. When it comes to basic betting strategy in 2-7, the early part of the hand is usually quite similar to holdem. When opening a pot, you should always come in for a raise and if your opponent draws more cards than you, you should always continuation bet. Pre-draw 3-betting is quite common and because it is a limit game it is almost always done for value. The best option early in your triple draw career is to maintain a balanced strategy and only 3-bet with your one card draws and pat hands. 3-betting your premium two card draws and flatting with your weaker ones is quite exploitable by good players. If you get dealt a pat hand pre-draw or a one card draw to a wheel like 2-4-5-7-x you should be looking to cap the action for four bets if at all possible. Betting when you’re a card ahead (your opponent has drawn more cards than you) is very important in triple draw. In situations where you both drew the same number of card and you didn’t improve, checking behind and seeing how many your opponent draws on the next round is usually the best play. The big bet streets, after the second and third draws are the most important (like the turn and river in holdem) primarily because this is when the most money goes in and secondly because there is more potential for players to make both betting and drawing mistakes. For instance if you both draw one card on the first draw and you make a hand like 8-7-4-3-2 and your opponent check-raises you, you’re left with a difficult decision on whether to call down hoping that he’s over-valuing a weaker pat hand than yours, or to break your hand and draw to the 7-4-3-2 hoping to hit a 5 or a 6. Handling these situations on later streets is very player dependent and that’s why it’s so important to pay attention to your opponents’ tendencies in triple draw. The most common bluffing situation in 2-7 occurs after the last draw when both players draw one card and you miss your draw and have to decide whether or not to bluff. In a typical hand where the action is a single raise pre-draw and a heads up pot where there is a bet after each draw, a bluff on the end will give your opponent odds of about 6/1, meaning that he needs you to be bluffing about 15% of the time for a call to be breakeven. Typically players will only bluff when they have paired up, and will hope to showdown hands like J-low and A-low in the hopes that their opponent has paired up. Keep the odds you are offering in mind when deciding to bluff on the river. When the situation is reversed and you’re facing a bet on the river, it’s important to keep detailed notes on your opponents so you’re aware of which players are likely to bet as a bluff when they hit a pair on the river. You’ll find that weaker players become very easy to read in this situation. In some cases you’ll even be able to call with a pair of twos or threes and win, which is a great feeling and a great way to tilt your opponent! Another bluffing opportunity in triple draw is called the ‘snow’. Snowing means turning what was a good draw into a bluff when you pick up a bad card and it looks like your opponent is weak. An example might be if you’re in position and your opponent draws two and you draw two at 7-5-4 and immediately pick up 8-6 for a straight. Now your hand is worthless, and any hand you could draw at isn’t particularly strong. If your opponent checks to you, you should bet and if he calls and draws again, you should continue to stand pat and bet. The best opportunity to snow comes when you pick up all four deuces in the deck. This means that no one can possibly make a 7-low, or even a good 8-low, so if you snow and bet and raise like crazy all the way, you should be able to make your opponents fold a hand as strong as 8-6-5-4-3. As with most games, your bankroll management should depend on what you want out of the game. If you’re a recreational player and you’re not too dependent on the money, then you can go with relaxed bankroll management. If you’re a professional player who depends on poker to pay the mortgage, then your bankroll management should be much stricter. Typically older poker books recommended a bankroll of 300 big bets for limit games but with modern software we can look into things in a bit more detail. A good aggressive 2-7 player will have a standard deviation from his winrate of about 19 big bets per hundred hands, meaning he’ll typically be up or down that much over the course of a hundred hands. Plugging this key statistic into a variance simulator shows that over a 20,000 hand sample, such a player would expect about a 50/50 chance of a 200 big bet downswing. 20,000 hands of 2-7 takes a lot longer to play than holdem. Typically the most you can play effectively is 2 tables, and you get about 100 hands per hour per table, so 20,000 hands is the equivalent of 100 hours of play, which might represent a month’s work for a professional player. The size of the expected downswing suggests a bankroll of close to 500 big bets might be more comfortable. In terms of hourly winrate, if you can eek out 2 big bets per 100 hands at $5/$10 over 2 tables, then you could be earning upwards of $40/hr with a $5000 bankroll. Contrast this with playing no limit holdem with a $5,000 bankroll where you would barely be properly rolled to play $1/$2 and would need to be six tabling with the same 2BB/100 win-rate which is a tall order these days. Click to return to our Poker Guide.